Hello everyone! 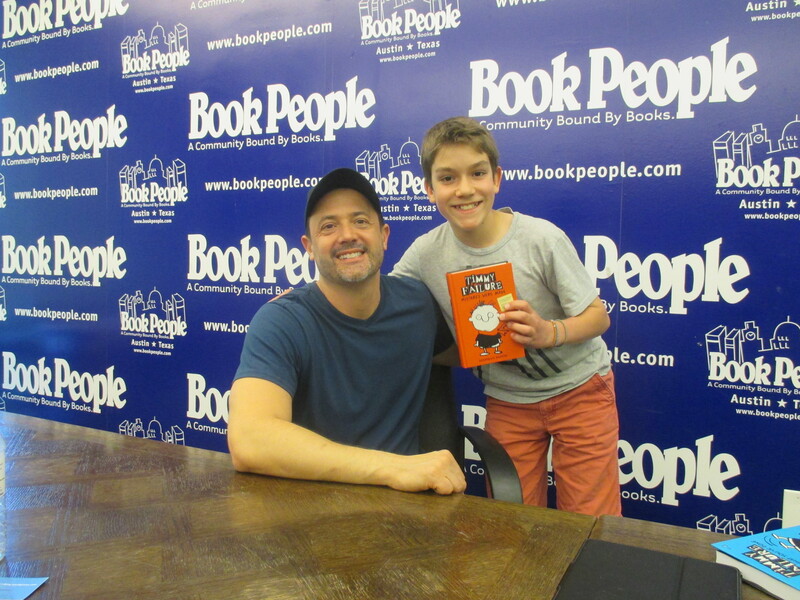 I have recently had the privilege of meeting and interviewing Stephan Pastis-Author of Timmy Failure and acclaimed cartoonist of Pearls Before Swine! He was a really funny guy, and his presentation was hilarious. I hope you enjoy the interview! Xander: Where did the ideas for Pearls Before Swine and Timmy Failure come from? 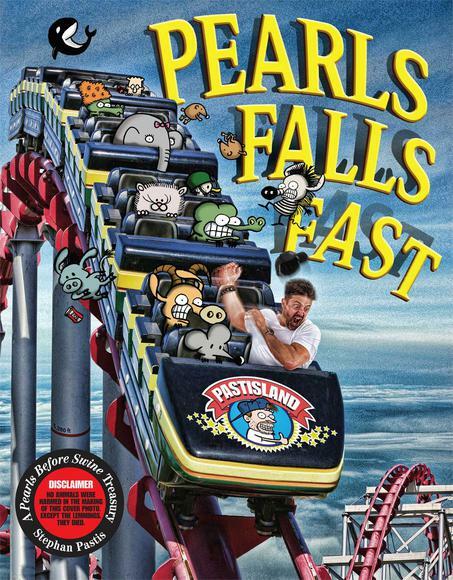 Stephan: Pearls came from a rat character I had drawn since law school, that I had come up with during a law school class, and Timmy came about simply because I thought it was funny, to have a boy detective who was not smart at all, who could not solve any mysteries. Xander: Was illustrating/drawing what you wanted to be as a child? Xander: Which illustrator do you look up to and admire and get ideas and inspiration from? 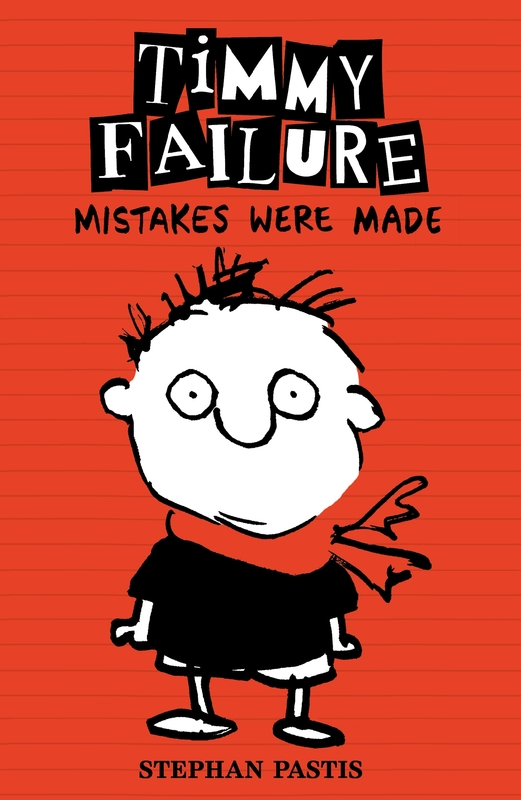 Stephan: Charles Schulz, who did Peanuts, Gary Larson who did The Far Side, Scott Adams who did Dilbert. Those were probably the three that had the most influence on me. Xander: About how long does one comic take to draw? 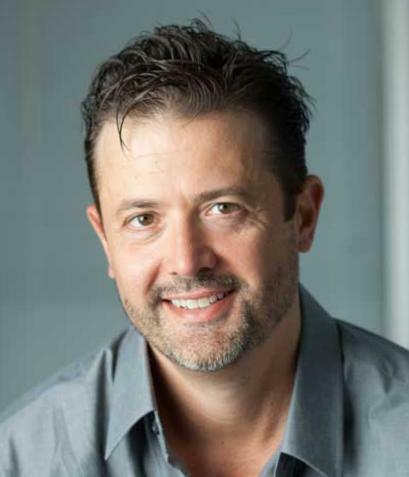 Stephan: Well, the writing part of it, which is the biggest part, is sort of hard to gauge. I’l write or three hours, and then I’ll generally have two strips in three hours. Sometimes three. Then I have to draw. So, drawing takes about two hours for a daily, and four hours for a Sunday. The Sundays are longer, because they’re bigger and I have to color them. I’d say the easiest way to gauge it is if I go a whole day from eight to seven and don’t waste time, I can write and draw three strips. Xander: So you’re full time? Xander: What would your spirit animal be? Stephan: What’s a spirit animal? Xander: An animal that represents you. Stephan: Well I guess I’d be rat. Xander: What is your favorite book? Stephan: My favorite book is a book called A Confederacy of Dunces by John Kennedy Toole. That’s a great, funny funny book. Xander: How long do you draw every day? Stephan: I go from eight to seven, four days a week. Monday through Thursday. And then Friday and Saturday I save for all the other stuff I have to do, like interviews, or book covers, or calendar covers, signing contracts, all the stuff that isn’t directly drawing the strip. Xander: What do you do to get inspiration? Stephan: I go to a coffeehouse and listen to really loud music on my iPhone, and drink coffee. That’s how I do it. Xander: What is your favorite part about illustrating? Stephan: My favorite part is that you have total control over it. No one can tell you what to do. So, whatever you can think of, is what you can do more or less, to some limits. Stephan: I guess it depends on what kind of cookie. I’d have to go with cookie, to be safe. Xander: Any upcoming books and projects that you’re excited about? Stephan: Yes. The third Timmy book comes out in October, called We Meet Again. That’ll be good. Xander: Are there more planned after that? Stephan: Yeah, we’re just in contract talks now, so hopefully there’ll be a fourth and a fifth. We’ll see. I would guess yes. And then I get to tour London and Ireland and Scotland for the Timmy series in October. Xander: Any country in the world-where would you go and why? Stephan: Boy, India. Because I’ve been reading all these history books on it. It seems fascinating. Xander: How long did it take you to write one of the Timmy Failure books? Stephan: They take seven weeks, more or less. I do it full time when I do Timmy, so I stop doing the strip. And then corrections take another two weeks. So maybe all told, nine weeks I would say. Stephan: Yeah, it is. I think Wimpy Kid is six months. But I don’t have the time, because I have to do the strip. Xander: So you do a daily strip? Stephan: Yeah. That’s hard, you have to do 365 over the course of the year. So, if you’re going to take a week off, you have to get ahead. Xander: Do you plan them in advance? Stephan: I really don’t, I just sit down and whatever comes out that day comes out. And I try to write ten between Monday and Thursday, which is more than I need, I need seven. But those are what enable me to do the book tours, and to write Timmy. Xander: Any advice to aspiring writers and illustrators? Stephan: Yeah, I would say the same thing. You know, because I didn’t go to art school, or take any writing classes or anything. I just wrote a lot. You know, just for myself. I always tell kids when I go to schools, it’s like anything else, like sports or something. If you play a sport, you end up practicing twice a week, or three times a week or maybe more. And writing’s the same. Even if it’s just ten minutes a day. You get better as you do it more. That’s really the only secret. Xander: How did you come up with what Timmy looked like? Stephan: I just had a little index card and I drew him on it, and he looked funny. I don’t know; he’s such an odd-his eyes are odd, and he doesn’t have a mouth, and his hair’s all goofy. Xander: I think he’s kind of cute! Xander: Why a polar bear? Stephan: I think because Timmy doesn’t have a dad, so the polar bear’s sort of a substitute for a dad-he’s big and strong, and in theory protective. But he’s also furry and soft, so he’s, you know, comforting. Stephan: Did I get the cookie or cupcake one right? Xander: That’s a matter of opinion! Stephan: What would you pick? Xander: I think cookie too, but cupcakes are good. Stephan: A cupcake can be really filling, though. It depends how rich it is. I’m not a big sweet eater. I like tacos, though. I have a weakness for tacos. Xander: What do you put on your tacos? Stephan: Ooh, man, I like a lot of lettuce, a lot of cheese, not that much meat. I’m not a big meat-eater. What else, that’s about it. No guacamole, and no sour cream. Because they’re too fattening. And then pizza, I like pizza, which is also fattening. Xander: Have you ever try pizza tacos? Stephan: I think I have. What is a pizza taco? Stephan: Did you just make that up? Xander: Put taco ingredients and fold it up in a pizza. Stephan: Oooh. I think you’re on to something. That’d be good. Stephan: Well that’s cool. Do you have anything else? Thank you so much Mr. Pastis for letting me interview you! I had a great time meeting you!